Protect wooden, laminate, tiled, marble floors & all hard surfaces from marring and scratches. 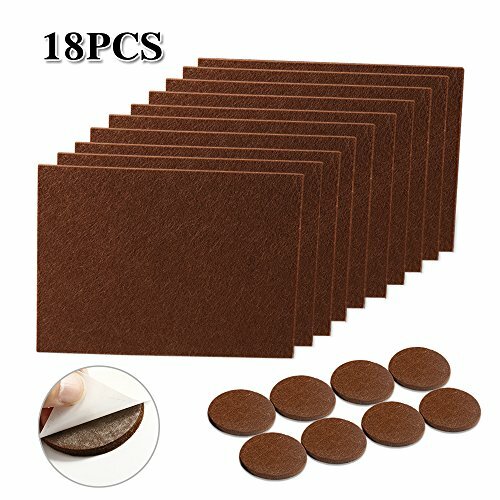 Long-lasting, heavy-duty felt furniture pads with extra-strength, self-stick adhesive and reduces friction and noise while moving furniture. Clean the leg of the furniture needed to stick. Use scissors to cut what size you need. Remove the 3M adhesive at the back. Stick it to the leg and press it for a while. Please do not drag the furniture frequently during the process. Please well-stick it at the first time, don't tear off and then paste it again. Please do not move the furniture once stick the pads within 48 hours. FURNITURE SLIDER :IdealHouse Furniture Sliders are great for the Beds, Chairs, Tables, Ottomans, Sofas, Refrigerators, Ovens ,makes the chairs or tables slide across the floor nicely,move the heavy furniture easily. SELF STICK,WORK GREAT:The furniture pads features the shape of round and square and 3M tapes,10 square and 8 round,the circular felt pads fit perfectly on chair legs,the square one works great on the big and heavy pieces of furniture. HIGH QUALITY MADE :IdealHouse Non Slip Furniture Pads is made of felt with recycled fibers and 3M tapes which is strong adhesive ,easy peel and stick it to any furniture surface and hold firmly for a long time. If you have any questions about this product by IDEALHOUSE, contact us by completing and submitting the form below. If you are looking for a specif part number, please include it with your message.